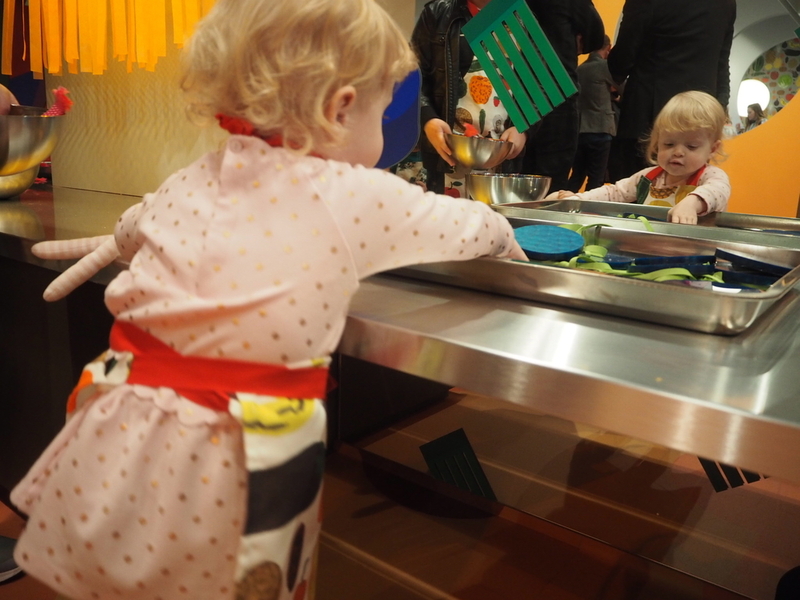 One of our guest contributor Kate and her Little Miss Twin Two checked out the preview of Fake Food Park: Martí Guixé for Kids at the NGV International for us last Friday and it looks delicious enough to eat! Here's their review. Giddy with excitement, Little Miss Twin Two and I couldn’t wait for the reveal of the latest NGV Kids exhibition, Fake Food Park: Marti Guixé for Kids. The exhibition space featuring Marti Guixe’s drawings, illustrations and fruit-and-vegetable wallpaper is enough to have your tummy growling from the moment you walk through the doors and The Wiggles lyrics ‘fruit salad, yummy yummy’ bouncing around endlessly in your head. Curved dining booths fill half of the area, each with several interactive touchscreens where visitors can participate in digital design challenges encouraging them to sprout new ideas for food concepts and flavours as well as creating their very own Fake Food Park menu. Little Miss Twin Two (aged 19 months) opted to bypass all the booths and in true toddler form headed straight into the custom-made kitchens to play with the food! After washing her hands and slipping on an apron (with a few length adjustments), we collected ingredients for her meal which included blocks, fabric and other colourful materials. Once the ingredients had been selected we moved around the kitchen adding heat, sound, texture, taste and smell by pressing buttons, turning knobs and winding handles. Of course this was a particular highlight for Little Miss Twin Two who endeavoured to add as many ‘extras’ to her meal as possible by pressing, turning and winding every button, knob and handle in sight for at least thirty minutes! Finally when her ingredient selection was deemed complete we presented it onto a computerised plate which magically transformed them into real food items on the screen. Amazing! Once we had finished with the ingredients, Little Miss Twin Two took great delight in returning them into the apple’s mouth (as well as climbing in after them to find out where they went!). After pulling her out of the holes we headed off in the direction of the dining booths. Even though Little Miss Twin Two did not fully understand all the concepts behind the digital activities, she still found them (and the headphones), super fun and interactive to use. After a truly entertaining morning, Little Miss Twin Two and I can highly recommend the new NGV Kids exhibition, Fake Food Park: Marti Guixé for Kids and we cannot wait to visit with her twin brother again very soon. For more information, head to our info page about this exhibition. Fake Food Park: Martí Guixé for Kids is on until the 11th of September.